Nvidia’s mid-range hardware has been on the market for quite some time now, but for several reasons we’ve somehow avoided writing about quite a few of the models that make up the company’s mainstream DirectX 10 lineup. 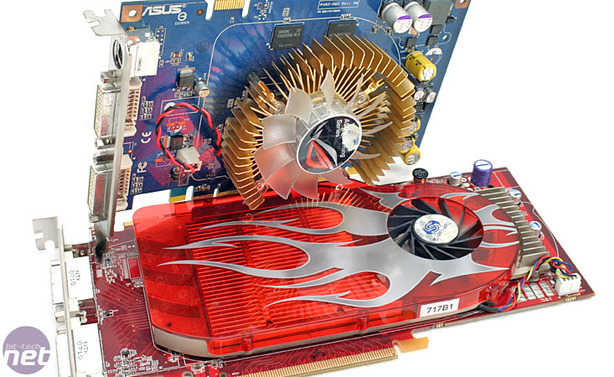 And let’s not forget AMD, either, as it launched its mid-range HD 2400- and 2600-series graphics cards at the end of June. Today we are looking at AMD’s top mid-range card, the ATI Radeon HD 2600 XT GDDR4 and in particular we’re looking at Sapphire’s product. Since this product is priced well under £100 (inc. VAT), AMD isn’t targeting Nvidia’s GeForce 8600 GTS; instead the company is taking aim at Nvidia’s GeForce 8600 GT, which can be purchased for anywhere between £75 to £110 including VAT. We’ve had Asus’ EN8600GT on the test bench for a while now and that’s the card we’re going to be directly comparing to the HD 2600 XT GDDR4. Coincidentally, while it’s not the cheapest GeForce 8600 GT on the market, this particular one has a very similar asking price to Sapphire’s HD 2600 XT GDDR4 and should make for an interesting comparison. It’s fair to say that this article has come a little later than we’d originally planned thanks to a slew of issues as a result of our move to Windows Vista. From the strange and inconsistent benchmark results to the bizarre instabilities and incompatibilities, we had all the issues we expected but didn’t encounter when we converted our high-end test rigs to Windows Vista at the start of May. Having worked with both AMD and Nvidia to fix some of the performance issues we were having, our benchmark results finally started to get consistent but the other issues just wouldn’t go away. After many more hours swapping components in and out though, we were able to narrow the problems down to certain component configurations that decided to give up the ghost in some of the most thought provoking ways. After getting to the bottom of those issues, I’m now confident in the results I’m about to show you (something I couldn't have said a few weeks ago) and I’m pleased to announce that our review is complete. At last, I can finally start to tell you, loyal bit-tech readers how both AMD and Nvidia’s new mid-range graphics cards hold up against one another.